When a mysterious gate suddenly appears in Tokyo's Ginza district and begins spewing armed warriors and flying monsters, the world is thrown into turmoil. Although the deadly attack is thrown back by Japan's Self Defense Force, there's now a new and entirely unknown land on the other side of the portal, and Japan is effectively at war with a nation on the other side. Determined to secure peace, the JSDF must send an armed force into the Gate, but ogres, dragons and a ruthless Empire populated by elves, humans, and half-animal warriors aren't the only dangers they'll face. With the resources of two worlds at stake, the balance of power on both sides of the Gate is destabilizing, and betrayal can come at any time, from any quarter. There, trapped right in the middle of the ensuing firestorm, stands officer Yoji Itami and the JSDF's Third Reconnaissance Team as they plunge into the GATE. 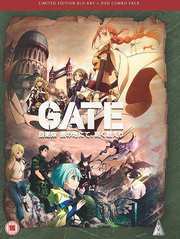 GATE the complete collection contains episodes 1-24 on Blu-ray and on DVD. Comes in a rigid artbox, with 12 artcards and a 74 page artbook.